Albinism is a hereditary condition that is characterized by a low or complete absence of melanin production that can be confined to the eyes or wide-spread in the body. People with albinism present with white skin, white or yellow hair and blue eyes. While the condition is rarely associated with any significant mortality, people with albinism tend to suffer from bleeding disorders, photosensitivity, and impaired vision. Treatment of visual impairment with low-vision aids and early-age eye patching might be needed. Albinism refers to a group of melanin synthesis disorders that are inherited. Patients develop a reduction or a complete absence of melanin pigment. The most common mutation to be associated with albinism involves the metabolic pathway that is responsible for melanin production from tyrosine. 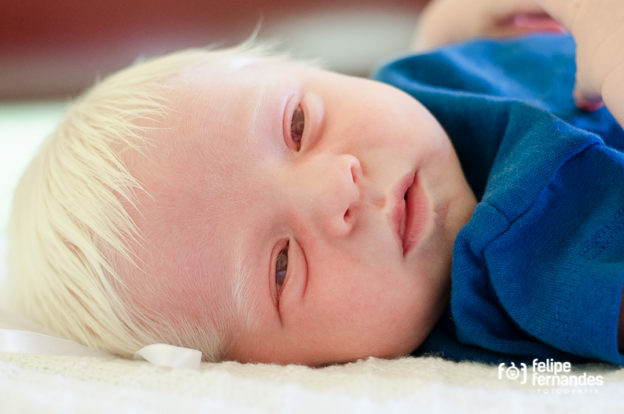 Albinism occurs due to genetic defects and can be passed on from one generation to another as it makes the body unable to produce the pigment melanin. The most severe form of albinism is called oculocutaneous albinism. Oculocutaneous albinism is defined as the reduction or absence of melanin in the skin, hair and the optic system. Ocular albinism is more confined to the optic system without cutaneous involvement. The prevalence of albinism is approximately 1 in 17,000 people in the United States. This gives a figure of about 18,000 people with albinism in the United States. Oculocutaneous albinism (OCA) types 1 and 2 are responsible for most cases of the condition. OCA 1 has a prevalence of 1 in 40,000 people, while OCA 2 has a prevalence of 1 per 15,000. OCA 2 is more common among African Americans compared to whites. A special type of albinism known as the Hermansky-Pudlak syndrome is considered the most common cause of albinism in Puerto Rico and has a prevalence of 1 in 2,700. This form of albinism, however, is very rare in other populations. Albinism is not associated with any significant mortality and most people are of normal intellectual capacity. OCA and ocular albinism can link to an increased risk of visual impairment in addition to skin photosensitivity. People with albinism are also known to suffer from social anxiety due to their different appearance as compared to their peers. OCA is common in both sexes, but ocular albinism is an x-linked recessive form of the disease that is only reported in males. OCA 1 and 2 are related to mutations in genes responsible for tyrosinase and P protein, respectively. These mutations are not x-linked. On the other hand, patients with ocular albinism are likely to have an x-linked form of the disease that involves the protein named OA 1. Melanin, which is a pigment that is photosensitive, protects the skin by absorbing ultraviolet light from the sun. Therefore, the absence of this photoprotective pigment can be associated with a higher risk of skin damage by sun exposure. People with albinism are therefore at risk of developing sunburns. Melanin is also found in the eyes, especially in the neuroectoderm that is responsible for the outer pigmented ciliary epithelium. When melanin is absent, the fovea fails to develop normally. Additionally, the absence of melanin in the eyes was found to be associated with abnormal connections between the retina and brain, hence abnormal visual processing can happen in people with albinism. People with albinism are thought to develop decreased visual acuity due to several reasons. Firstly, increased access of light to the retina might actually result in retinal damage. Additionally, as discussed above, the foveal development is impaired during early life because of the absence of melanin. People with albinism, in addition to the characteristic loss of melanin from the skin, also report different ocular symptoms. Photophobia and decreased central vision due to hypotrophy of the fovea are common findings. Additionally, easy bruising, frequent nosebleeds and prolonged bleeding after surgery or dental work are commonly identified in people with albinism. People with Hermansky-Pudlak syndrome might have a family history of albinism. People with OCA type 1 have skin hypopigmentation at birth, white hair and blue irides. People with OCA type 2 might have normal skin pigmentation or absent skin pigmentation. Some people might have a complete absence of melanin at birth making the condition difficult to distinguish from OCA type 1. The main difference between OCA type 2 and 1 is that the former is associated with increased pigmentation as the child ages. In fact, this increased pigmentation is very significant clinically because visual performance is reported to improve in people with OCA type 2. African Americans affected by OCA type 2 usually have yellow hair at birth which remains yellow through life. They also have white skin that does not tan. Ocular albinism type 1 is an x-linked trait, present with eye involvement without any significant skin changes. These people can develop decreased visual acuity, fundus hypopigmentation, foveal hypoplasia and the presence of nystagmus. X-linked ocular albinism only affects males as females can be the only carriers. Test for Albinismise conducted on the patient’s blood sample. There are some risks involved that the patients might feel a bit light headed and if the patient is diabetic, he/ she may suffer from blood loss too due to the syringe involved for drawing blood during the genetic testing. People with a complete absence of melanin from their skin, hair and eyes are easy to be diagnosed clinically with albinism. The confirmation of the disorder, however, needs specific and sophisticated laboratory tests to be performed. The identification of the tyrosinase enzyme activity from the hair bulb is useful. This test can provide quantifiable information as radiolabeled tyrosine can be provided, and the amount of melanin produced can then be determined. People who have an incomplete absence of the enzyme activity will show a non-conclusive test result, and the diagnosis cannot be ruled out. Because of this reason, genetic testing is the only diagnostic tool to confirm the diagnosis of albinism. Genetic testing for albinism is usually provided for people with familial forms of albinism and not for people with sporadic cases of albinism. People with albinism are at risk of bleeding complications from surgeries. For this, bleeding time and platelet aggregation tests are advisable for any person with albinism who is going to undergo a major surgery. People with albinism are at risk of developing foveal hypoplasia, among other foveal abnormalities. Optical coherence tomography is useful in the evaluation and assessment of the fovea and other parts of the retina. People with albinism are also at risk of developing diminished visual acuity; visual evoked potentials have been found to correlate with visual acuity in albinos. Finally, people with albinism can have a skin biopsy performed for research purposes. Histological examination of a skin biopsy reveals the presence of macromelanosomes. People with albinism might need low-vision aids and tinted glasses to correct for refractive errors and photophobia, respectively. Due to refractive errors, people with albinism might develop strabismus. Eye-patching should be used as early as possible, better if at the age of 6 months, for the optimum correction of strabismus. People who wish to improve their hair and eye color might benefit from nitisinone, which increases the plasma tyrosine levels and helps with increasing the melanin levels in the skin, eyes and hair of people with hereditary tyrosinemia type 1. There are some precautions these patients should always take. Shielding the eyes and skin from the sun is recommended. Patients should use sunscreen with high sun protection factor when going out in the sun and should cover themselves up through proper clothing when going out in day light. To protect their eyes they should wear sunglasses (UV protected). Retinal detachment is a common complication in people with albinism. Retinal detachment repair surgery might be needed, but unfortunately, the prognosis after surgery for restoration of normal vision is usually bad. It is postulated that vision cannot be improved with surgery in people with albinism for two main reasons: the absence of retinal pigmented epithelium and the abnormal retina-brain neural connections and cortical processing of visual stimuli. K , W. et al., 2011. Fitzpatrick’s Dermatology in General Medicine. 8th Edition ed. New York: Mc Graw Hill.